In 1974, artist James Nares came to New York from his native England and jumped right into the downtown scene. It was the beginning of the punk era, and the possibilities were endless. He joined a band, played at CBGB’s, continued his painting career, opened art spaces with his friends. And he made films. Nares was part of the celebrated No Wave movement of cross-pollinating filmmakers, musicians and artists. But his style is entirely his own. This is true punk cinema: DIY, super-8mm, no-budget, and aimed straight for the gut. But these are also resolutely art films, with surprising moments of rough yet lyrical beauty. In Pendulum, Nares converts a city block into a space for a large copper ball to swing back and forth, suggesting both play and danger. In other films, the artist explores political commitment, or his own body, or the tactile beauty of tools and art materials. But no matter what’s going on in front of the camera, the real subject of many of these films is 1970s New York. Made in the oddly deserted streets and abandoned lofts of Tribeca, they show a messy, vital, haunted urban landscape almost unthinkable today. Alongside his far better-known work as a painter, Nares has continued to make films and videos to the present day. His early films were long thought lost, but happily were rediscovered in storage earlier this decade. In 2008, these films and videos were restored and screened by Anthology Film Archives. Many of them had never been seen in public, and to this day have hardly been screened outside of New York. Film Love proudly brings to Atlanta a selection of James Nares’s films and videos – a poignant, engaging, sophisticated artistic vision in the DIY spirit. Cloth (1998), 3 minutes. A hand twirls a cloth in super slow-motion – the closest film visually to Nares's paintings. Ramp (1976), 3 minutes. A concrete ball rolls disastrously downhill, camera and microphone in tow. Game (1976), 3 minutes. Seen from above, a mysterious game with two players, stones, and "long forgotten rules." Steel Rod (1976), 5 minutes. In a tribute to Richard Serra, Nares and a friend play a game of catch with the titular object. Ouch! Weather Bed (1991), 3 minutes. A hurricane in the sheets. Pendulum (1976), 17 minutes. 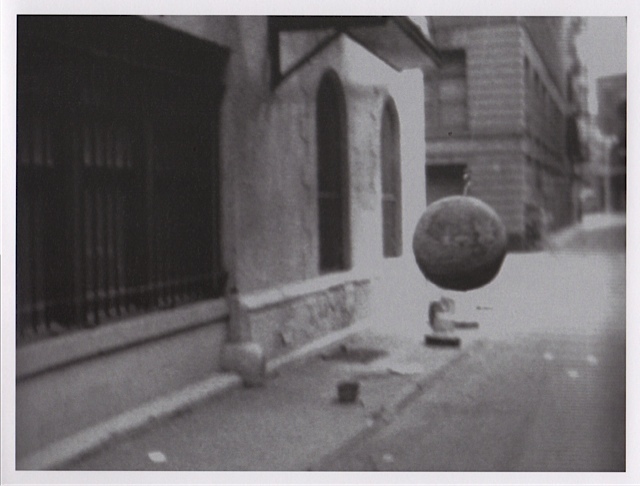 A heavy ball swings repeatedly down a city street in lower Manhattan. A haunting film that reveals a long-disappeared Tribeca landscape. Primary Function (2007), 2 minutes. "Red...blue...yellow...red..."
Suicide? No, Murder (1977), 30 minutes. A unique hybrid film – diary, documentary, artist’s film – about Nares’s 1977 return to London in the midst of political turmoil and the emergence of punk. Waiting for the Wind (1982), 8 minutes. "A technical tour-de-force" – Amy Taubin. A tornado hits Nares's soon-to-be-abandoned loft. JAMES NARES is co-sponsored by the Atlanta Contemporary Art Center. JAMES NARES is a Film Love event, programmed and hosted by Andy Ditzler for Frequent Small Meals. Film Love promotes awareness of the rich history of experimental and avant-garde film. Through public screenings and events, Film Love preserves the communal viewing experience, provides space for the discussion of film as art, and explores alternative forms of moving image projection and viewing. Film Love was voted Best Film Series in Atlanta by the critics of Creative Loafing in 2006, and was featured in Atlanta Magazine's Best of Atlanta 2009.